NOTE: Natural Vanilla Flavour Shown. Nutritional information and ingredients may vary from flavour to flavour. 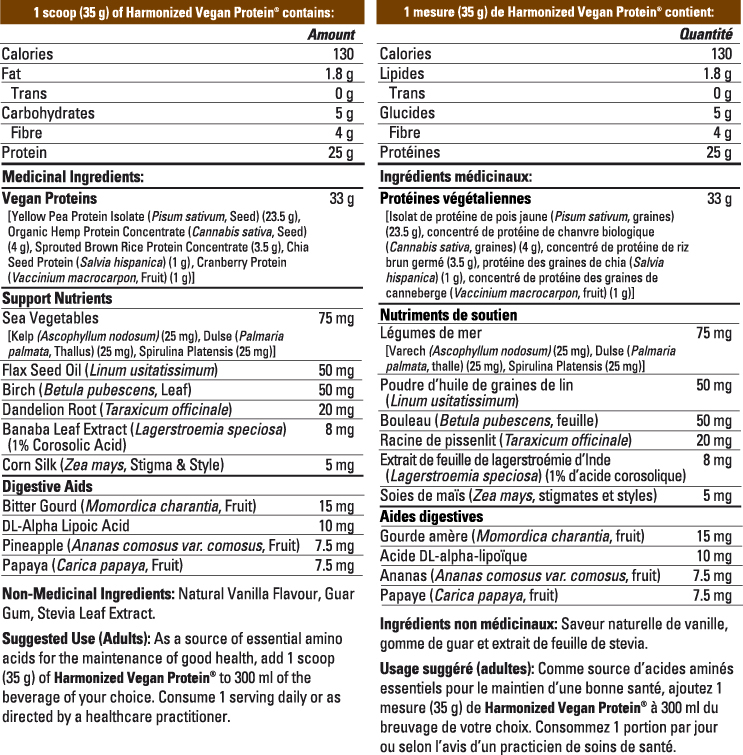 Non-medicinal Ingredients: (Dark Chocolate): Cocoa, Natural Flavours, Guar Gum and Stevia Leaf Extract. Non-medicinal Ingredients: (Vanilla): Natural Vanilla Flavour, Guar Gum and Stevia Leaf Extract. 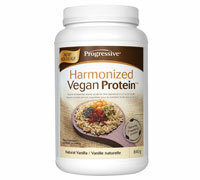 Suggested Use (Adults): Add 1 scoop (35 g) of Harmonized Vegan Protein® to 300 ml of the beverage of your choice. Consume 1 serving daily or as recommended by your health care practitioner. Harmonized Vegan Protein™ has been fortified with support nutrients designed to assist with every aspect of digestion from ingestion to elimination. It's a multi-stage strategy that begins with a blend of vegetarian enzymes designed to enhance the digestion and intestinal absorption of the proteins, fats, carbohydrates and fibre found in Harmonized Vegan Protein™. At this point your liver is called upon to process the incoming protein. Two botanical extracts (Betula Pubescens and Dandelion) have been included to support the liver's efforts and to help ensure optimum compatibility. This is followed by the addition of Alpha Lipoic Acid (the natural form bound to Potassium for greater stability), which has a long list of beneficial properties including supporting liver function, providing free radical defense and reducing glycation (an undesirable reaction between proteins and simple carbohydrates). It also assists in transporting amino acids from the bloodstream into your cells. The benefits of the protein can now be realized, but keep in mind the kidneys are still responsible for eliminating the waste products associated with protein consumption (including uric acid and ammonia). A third botanical extract (Zea Mays) has been included to help balance and support kidney function.